I passed this cafe on the way up the hill from Lakshman Jhula (bridge), on the west bank of the Ganges. 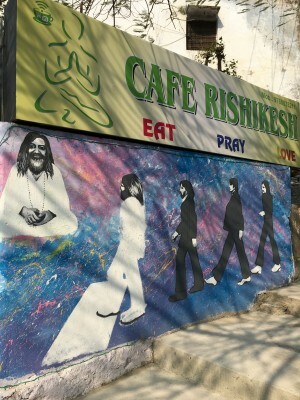 The mural features Maharishi Mahesh Yogi and the Beatles. Eat, Pray, Love is a memoir by Elizabeth Gilbert, who was played by Julia Roberts in the film of the same name.